The American Association of Orthodontistis estimates that more than 1,600,000 of adults in the United States and Canada are receiving treatment from orthodontists. Today, orthodontic treatment is a viable option for almost any adult. If an orthodontic problem is left untreated-it may become worse. When you have a malocclusion or “bad bite”, your teeth may be crowded, excessively spaced or may not fit together correctly and such conditions may lead to teeth wearing, chipping and cracking and other dental and TMJ related health problems. Whether you choose to do metal braces, clear braces or Invisalign we can help you accomplish all of your smiles esthetic and functional needs. 1) Can orthodontic treatment do for me what it does for children? Yes. Healthy teeth can be moved at any age. Many orthodontic problems can be corrected as easily for adults as for children. 2) How does adult treatment differ from that of children and adolescents? Adults are not growing and may have experienced some breakdown or loss of their teeth and the bone that supports the teeth. Orthodontic treatment may then be only a part of the patient’s overall treatment plan. Close coordination may be required among the orthodontist, oral surgeon, periodontist, endodontist and family dentist to assure that the treatment plan is managed well. 3) I have painful jaw muscles and jaw joints – can an orthodontist help? One of the problems commonly associated with jaw muscle and jaw joint discomfort is bruxing or habitual grinding or clenching of the teeth, particularly at night. Bruxism is a muscle habit pattern that can cause severe wearing of the teeth, and overloading and trauma to the jaw joint structures. Chronically or acutely sore and painful jaw muscles may accompany the bruxing habit. An orthodontist can help diagnose these problems. Some solutions may be as simple as a night guard or a splint and other times orthodontic treatment may be necessary if your bite is part of the reason why you are experiencing TMJ syptoms. Sometimes structural damage can require joint surgery and/or restoration of damaged teeth. If you are experiencing TMJ pain, click, pop or headaches do not delay, the more you wait the more structural damage can occur! 4) My teeth have been crooked for many years – why should I have orthodontic treatment now? It’s never too late! Orthodontic treatment is a positive step to resolving any long-standing problem orthodontic problems. Orthodontic treatment can restore good function and create a healthy, beautiful smile that can improve self-esteem, no matter the age. As a matter of fact, adults make up about 40-45% of our practice. Call right now and do not delay, you are not alone! 1) INVISALIGN®-The clear alternative to braces. Orthodontic research and development has allowed the orthodontist to offer metal and clear braces that are smaller, smoother and more comfortable.Different types of bracket exist on the market and Dr. Kriger chooses on the top orthodontic bracket manufacturer for her patients brackets. METAL BRACKETS: Children, teens and adults love the comfort of the small metal brackets. Changing the color ties that hold the wires in place is always exciting for all ages. Of course, clear or gray ties offer an esthetic choice to blend in with the bracket. CLEAR BRACKETS: They are comfortable and barely noticeable and with the aid of a tooth colored wire, the smile looks phenomenal! 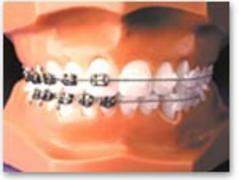 Clear Brackets are perfect for an older teen and Adult. Please contact us if you have any questions and/or would like to discuss how we can assist your needs.